Some tips and tricks for making your Mini Camper trip go smoother. 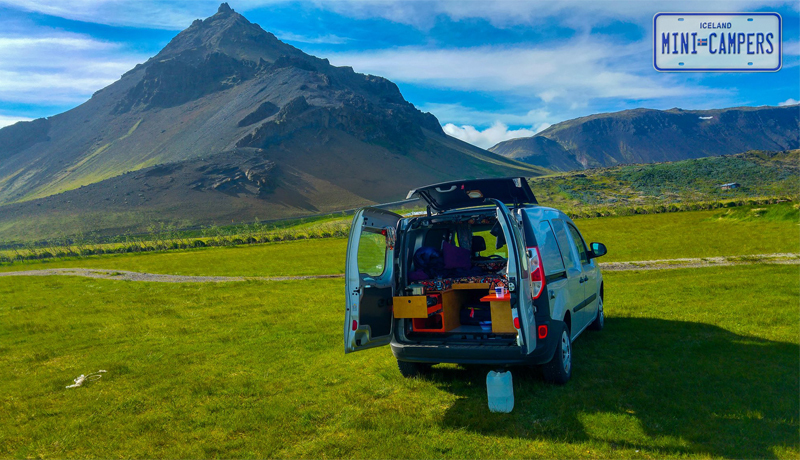 Our customers, the dynamic duo Mel and Vin who run the website https://www.melvinout.com/, recently wrote an article about their Mini Camper trip around Iceland (see here: https://www.melvinout.com/single-post/2017/06/11/10-Tips-for-Traveling-Iceland-in-a-Campervan). All in all, their experience was positive but, as Mel puts it “There were days where I felt like I was experiencing the most incredible thing in the world and others where I felt lucky to be alive.“ Their list is very helpful and we wanted to respond to some of these issues as well in the hope of offering up some solutions and hands-on advice. At the moment, Iceland is experiencing an economic boom that is partly driven by the huge increase in tourism in the past few years. One of the results is that the value of our currency, the króna, has risen sharply, especially in the last couple of years. For visitors, this simply means that everything is more expensive and, for a destination that has never been especially cheap, this sometimes makes for some shocking numbers. For instance a common price for a large beer in a bar is now around 1000-1100 krónur, equal to around 9 EUR or 10 dollars, which most will agree is pretty high. As Mel and Vin point out, the best solution is to shop at the Iceland’s alcohol monopoly, the ÁTVR or “Vínbúðin” which has stores in most towns around the country (see store locator and opening hours here: http://www.vinbudin.is/english/home/opnunartimar.aspx). As I mentioned above this is a state-run alcohol monopoly which means that no other store is allowed to sell alcoholic beverages, including beer. Which brings us to the next issue. The “beer” sold in supermarkets and convenience stores is not actually beer but a very light alternative with a maximum alcohol percentage of 2.25%. In order to get passed laws that make it illegal to advertise alcohol, breweries in Iceland often manufacture low-alcohol alternatives that are almost identical to the real thing and sold in shops as seemingly perfectly normal cans of Viking, Carlsberg or whatever. To add to the confusion, Iceland‘s low-alcohol beer is usually marketed and sold as “Pilsner” which means regular lager beer pretty much everywhere else in the world. Recently stores have been criticized for trying to cash in on this misunderstanding, not batting an eye when tourists check out with case-loads of beer, on their way to party hard with what is essentially non-alcoholic beer and produces little or no effect under normal circumstances. So, as Mel and Vin advise, if you want to have a drink after a long day of travel use the Vínbúðin or better yet, stock up at the duty free store when entering the country. That said, we of course recommend taking it easy with alcohol and remember that drinking and driving is a very serious offence in Iceland. Mel and Vin also mention being shocked by restaurant prices and describe how they were put off the whole idea after sharing a pricey portion of fish and chips. Restaurant prices in in Reykjavík can be pretty steep but the influx of visitors has also had the positive effect of there being all kinds of different restaurants and cafés catering to different price ranges. A good idea would be to do a little research beforehand, like searching for cheap eats on Tripadvisor.com or checking out the “Best of 2017” lists in Reykjavík Grapevine magazine (see here: https://grapevine.is/tag/best-of-reykjavik-2017/) which lists everything from best brunch or late-night bite to the best place to “get lovey-dovey” with a date. In general one would do well to watch out for tourist traps that try to overcharge for food, drink and services as there always seems to be a few rotten apples trying to take advantage of foreign visitors. In the end, Mal and Vin mostly shopped for groceries and this, together with traveling in a Mini Camper, is probably the most cost efficient mode of traveling around Iceland. If the grocery stores seem underwhelming, keep an eye out for local produce at various farmers’ markets or visit the food section in Reykjavík’s Kolaportið weekend flea market. I think we can safely assume that almost nobody visits Iceland for its nice weather. Mel and Vin describe having problems with first becoming drenched but then having a hard time getting dry again while on the road. As for the ever changing weather situation in general Icelanders often say that if you don’t like the weather, you should wait ten minutes. A better solution, suggested by Mel and Vin would be dressing in layers which is sound advice. A waterproof shell, a base layer and warm sweater should do the trick for almost every season, as well as keeping a hat and mittens close just in case. If your clothes do get wet during your camping trip and the weather is too wet to dry them outside, there are several campsites around Iceland that offer a tumble dryer or a drying room (campsites are searchable by facilities here: https://en.camping.info/iceland/campsites). Also, to conclude this point, local tourist information offices are usually happy to help. As for the shower situation, there is a simple and wonderful answer for that. Iceland has around 170 geothermally heated swimming pools around the country, with at least one in most towns, however small. A trip to the swimming pool comes at a reasonable price, includes showers and complimentary soap (showering is mandatory to keep the pools’ chlorine levels down), and usually offers a selection of hot pots and often even a steam bath too. Guests are expected to bring their own bathing suit and towel, but these are also available to rent at most places (a list of swimming pools, searchable by region, can be found here: http://sundlaugar.is/?lang=en). Seljavellir one of the most beautiful swimming pool in Iceland. 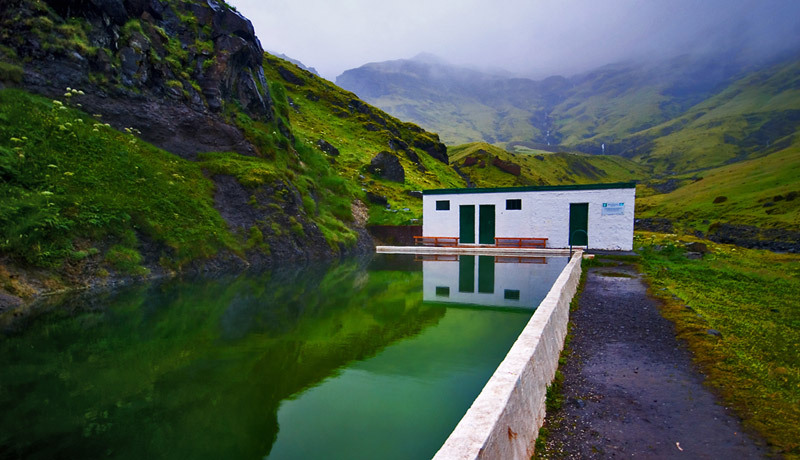 We have often said that it is the swimming pools, along with the frequency of campsites, which make Iceland ideal for a Mini Camper trip. Wherever you are in Iceland, you are usually not far away from the next swimming pool, which often means soaking in a hot pot, chatting with the locals and admiring the view. Mel’s travel diary describes some scary scenes from being on the road, navigating winding gravel roads, often coupled with sharp gusts of wind, sometimes even along steep cliffs. We agree that the roads in Iceland can be scary, especially at remote locations where proper upkeep tends to get neglected. What we can advise here is to driver slower than usual and, if you get a chance, consult this very useful website, http://www.road.is/, which is run by the Icelandic Road and Coastal Administration (IRCA). The website has the most current information on roads and weather conditions, as well as a wealth of information on driving safely in Iceland. In conclusion we will quote Mel and Vin’s article once more where they hit upon the matter with a needlepoint (rem acu tetigisti, as the Romans used to say). Thanks for your insights Mel and Vin, we hope you will be returning soon!